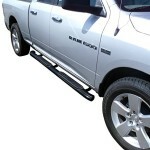 RUNNING BOARDS - Complete Vehicle, Inc.
5" Stainless Steel Oval Bent End Side Steps by TrailFX. Rocker Panel Mount. This product is made of high-quality materials to serve you for years to come. distance by 6 Inch for easy vehicle access. The all new PRO TRAXX® 4 Inch Oval Tube Step Bar features a bold series unique saddle mounted step pad. We've taken the Pro Traxx 5 to a new level of bold. The tube used for this product has girth and a wide step area that offers a sleek and clean look. 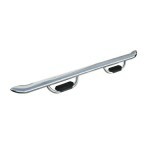 5" R5™ Series Cab Length Polished Nerf Step Bars (28-51090) by Westin®, 1 Pair. Material: Stainless Steel. Rocker Panel Mount. Step up with Westin’s new R5 Nerf Step Bars! Built with the highest grade corrosion resistant materials, they give your truck the function and stylized look it deserves. Designed and engineered in the USA, our R5 Nerf Step Bars mount directly to your vehicle’s rocker panel and include injection molded bracket covers for a clean, high-end appearance. Get a boost with Westin’s R5 Nerf Step Bars today.